Just was reminded about Scratch, a visual programming language helpful to teach programming. your creations on the web. Scratch is designed to help young people (ages 8 and up) develop 21st century learning skills. This week I am in Michigan for the 3rd International Communities and Technologies conference. In some ways I am definitely a fish out of water as this is an almost 100% academic crowd. In other ways I am learning.a.lot! Hopefully lots of information transformed into articles on our main site or as blog posts here in the following weeks. For now, back to the sessions. 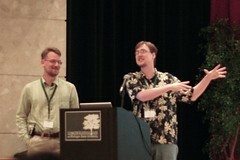 The photo is of Rob Malda & Jeff Bates, two of the original slashdotters. They presented on meta-moderation. iPhone. No, this post has nothing to do with it, but EVERY other blogger is posting about the iPhone today and I wanted to sort-of-imitate the cool kids. Heh.